Getting your nails done, both fingers and toes, is an indulgent gift to yourself. If done well, it feels good, looks good and can be an artistic personal statement. Here are 10 salons in New Mexico that do it best! Pick a color, any color. There are 50 different ones to choose from, plus creative patterns, designs, and shiny bling to make every fingernail distinctive. It begins with a soak in warm water, a relaxing hand massage, then a little filing and buffing and moisturizing before the final step … a beautiful color. Professional nail technicians help you find just the right look for beautiful hands. Add a pedicure for beautiful feet, too. This is a family-run shop and customers are treated as family members. It’s casual, warm and welcoming. Nail care includes a basic, French or American manicure, plus acrylics and gels. Add some rhinestones or stickers for added glitz. Technicians on staff for pedicures, waxing and facials. Choose a polish from the wide-ranging spectrum of colors and make a vivid statement. Add a little moment of quiet to your day and spend some time here getting a mani, a pedi or both. Manicures of all types include basic, hot oil, deluxe, cool gel, French and magnetic marble gel. Dip your feet into a warm bath in preparation for a pedicure that can include a hot stone massage or sea salt scrub or cooling gel. Nail technicians are accomplished at acrylic nail process. Share the experience with your children. Waxing services available, also. If you’ve always wanted hot pink finger nails or black and white striped or ruby red with gold accents, here’s when you can get that and more. From the comfort of a soothing massage chair, have your nails sculpted into works of art. Both acrylic and solar nail processes possible. Pedicures include callous treatment, a massage and polish. Personal care services include eyebrow shaping and clean-up. Do a buddy pedicure with a friend or family member in a private room just for that. “Life is too short to wear boring nail polish.” That’s the formula for success here. Vibrant colors, artistic designs, the latest techniques and trends, safe and clean environment and friendly service all come together to create an experience that keeps both everyone coming back. Bring a group for a special event and let everyone get pampered with a first-rate manicure and pedicure and a relaxing massage that’s a great personal pick-me-up. A wall of vivid nail polish, bright turquoise chairs and a vibrant orange sign that says welcome is the greeting for all customers. Manicure options are varied from acrylics to solar fill to dipped nails to gel polish. Pedicures run the gamut from spa to therapy to just a toe polish. Children under 12 get a reduced price and a free design. Waxing, for men and women, makes personal care easier. This locally-owned business has two commitments to customer: pampering and relaxing. The nail salon is separate from the hair salon and is staffed with multiple technicians. Combining current trends and techniques with customer preferences is the goal. Services are extensive: gels, acrylics, slickpour, backfill, full set, free edge, overlays, glitter, nail art…so many choices. Pedicures include a hot towel massage. Personal care treatments include waxing. Organic and vitamin rich products used when possible. The staff here help make this a fun place for husbands and wives, mothers and daughters, BFFs, partners and work buddies to spend some time together in an indulgent environment. Even though appointments are encouraged, the shop can accommodate a lot of customers, so walk-ins are welcome. Celebrate all of life’s high points with distinctive fingernails that capture the season and the event. Services cover basic and complex manicures and pedicures. Step into the tranquil surroundings at this salon for a breath of fresh air. All products are ammonia and sulfate free so there’s no chemical odors. Natural, green and organic products are used; a good practice for everyone in the shop. Try the New Mexico Moisture manicure or pedicure for a deep moisturizing treatment that begins with a eucalyptus bath soak and a revitalizing sugar scrub. Nail grooming and polish follow with a final revitalizing massage with natural oils. 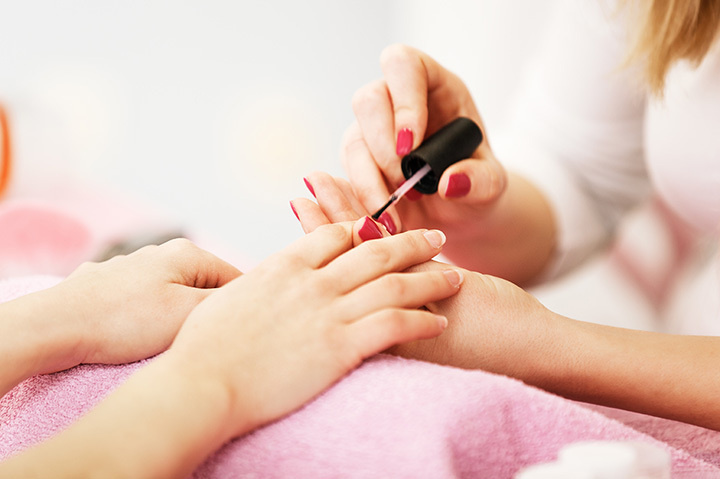 Additional manicure services include gel and French nails, paraffin and clay masque treatment. The ionic foot bath promises to reduce stress, remove toxins, help with pain relief and improve sleep. What a full-service locally-owned and operated salon this is! Manicures and pedicures by Designs by Vian who specializes in acrylic nails, gel nails, 3D nail art, chrome nails, holographic nails and stamped nail art! Get a Honey Heel glaze treatment as part of a pedicure to repair damaged feet. While you’re there you can also have your hair styled. Personal care services include makeup and skin care, waxing, eyelash and hair extensions and ear piercing.